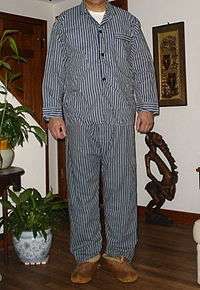 Pajamas - loose fitting two-piece garments for women, men and children. They may be made from cotton, silk, satin or synthetic materials. †Most common response in 'Other' from women was outdoor clothes, from men shorts. On 22 December 2011, the U.S. Consumer Product Safety Commission (CPSC) issued a letter to manufacturers, distributors, importers and retailers reminding the apparel industry of the enforcement policy and their obligations associated with children’s sleepwear and loungewear. The Commission’s regulations define the term children’s sleepwear to include any product of wearing apparel (in sizes 0-14), such as nightgowns, pajamas, or similar or related items, such as robes, intended to be worn primarily for sleeping or activities related to sleeping, except: (1) diapers and underwear; (2) infant garments, sized for a child nine months of age or younger; and (3) tight-fitting garments that meet specific maximum dimensions. All children’s sleepwear and loungewear sold in the US are required to comply with the Flammable Fabrics Act (FFA) using the standards for Flammability of Children’s Sleepwear 16 C.F.R. Parts 1615 and 1616. Moreover, they have to comply with the Consumer Product Safety Improvement Act of 2008 (CPSIA) requirements including tracking labels, a certificate of compliance, meeting requirements for lead content and surface coatings, and meeting requirements for phthalates.